Born on 12th of December 1731, Erasmus Darwin was an English physician, poet, physiologist, natural philosopher, inventor, and slave-trade abolitionist. Erasmus was the member of Darwin-Wedgwood family which includes other famous personalities like his grandsons Francis Galton and Charles Darwin. Is Erasmus Darwin related to Charles Darwin? What is Erasmus Darwin famous for? What was Erasmus Darwin’s Theory of Evolution? How did Erasmus Darwin contribute to Evolution? Was Darwin the first person to talk about Evolution? What was the Lunar Society famous for? Born in 1731 at Nottinghamshire, England, Darwin was the youngest of seven siblings. His father Robert Darwin of Elston was a lawyer and physician. He got his education at Chesterfield Grammar school, then at St John’s College, Cambridge. Later he went to the University of Edinburgh Medical School for his medical education and obtained a degree of MD. Darwin started his practice as a physician in 1756 at Nottingham and then to Litchfield. Soon after his arrival at Litchfield, he could restore the health of a man whose death seemed unavoidable. Darwin became a successful physician in his career such that George III once invited him to be a Royal Physician, however, Darwin declined the offer. Mary Darwin died in 1770. Erasmus hired Mary Parker to look after Robert. In the next year 1771, Erasmus and Mary involved in intimate relationships and they had two illegitimate daughters. These two daughters later established a girl boarding school. However, in the later years, Mary married a Birmingham merchant and moved away. In 1775, Erasmus met Elizabeth Pole who was a married woman. They had four sons and three daughters. One of their sons died in infancy. Erasmus Darwin was the grandfather of Charles Darwin. Erasmus’s son Robert Waring Darwin married Susannah Darwin. Charles Darwin was the fifth of the couple’s six children. Darwin was famous for his botanical works. He formed a society named ‘A Botanical Society, at Litchfield’ along with Sir Brooke Boothby and Mr. John Jackson. The society’s main work was to translate Carl Linnaeus’s botany work from Latin into English which took almost seven years. The botanical work was published in two parts: ‘A System of Vegetables’ between 1783 and 1785 and the other in 1787 named ‘The Families of Plants’. Darwin is known for his published book named ‘The Botanic Garden’ which was the merger of his famous long poem ‘The Loves of the Plants’ and ‘Economy of Vegetation’. His most famous work is ‘Zoonomia’. It contains a system of pathology and Generation. In this, he had foreseen the views of Jean-Baptiste Lamarck, which help in deriving the modern theory of evolution. He had predicted a very well theory ‘Survival of the fittest’ in Zoonomia. He provided the theory for every survival are depended on three great objects of desire: ‘lust, hunger, and security’. He worked for the women education greatly and inspired his two illegitimate daughters Susanna and Mary, to establish a boarding school for girls. He had invented several devices such as a horizontal windmill, Ackermann Linkage, Canal Lift, Minute Artificial bird, a copying machine. He also sketched a simple hydrogen-oxygen rocket engine, which was used in making a rocket almost a century later. He provided the theory where all warm-blooded animals have emerged from one living filament, with the power of acquiring new parts, directed by irritation, volitions, sensations, attended with new propensities and associations. This continual improvement would be passed down to generations and would emerge as a better resulting being to endure life further, a world without end. Darwin’s theory was based on David Hartley’s psychological theory of associations. 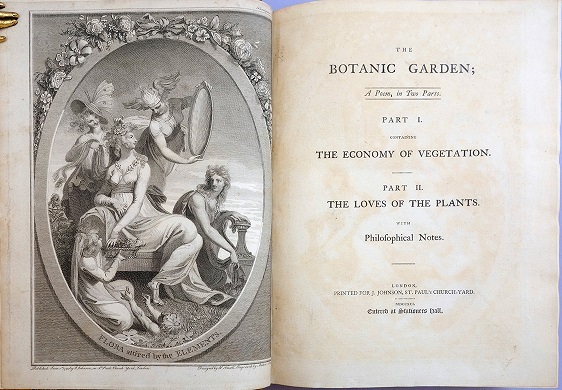 Darwin mentioned his theory of evolution in his popular poem ‘The Loves of the Plants’ in 1789, which was later republished as ‘The Botanic Garden’. His final long poem published posthumously named ‘The Temple of Nature’ centers his own conception of evolution which shows the progression of life from microorganisms to the civilized society. One of the passages of the poem describes the struggle of existence. Erasmus provided the basic theory on the species’ evolution. This work helped Jean-Baptiste Lamarck and very famous naturalist and Erasmus’s grandson Charles Darwin to derive the modern theory of evolution. Erasmus gave the idea that the strongest and most active animal should breed specimens and promote and spread the species further which would be the improved and stronger version of the previous generation. This theorem helped to derive the theory of survival of the fittest. The concept that the species change over time and evolve to better quality and strength rooted in the ideas of the ancient Greeks, Chinese and Roman science. The concept of medieval Aristotelian metaphysics and then the natural theology gave birth to modern science. 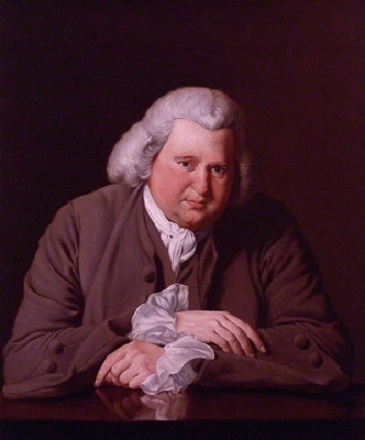 Erasmus Darwin was one of the early naturalists who gave the idea of evolution through different supporting theorem and poems. Erasmus’s great work gave foundation to Jean-Baptiste Lamarck in the early 19th century who proposed the theory of the transmutation of species. This is considered as the first fully formed theory of evolution. Later in 1858, Charles Darwin, grandson of Erasmus Darwin, along with Alfred Russel Wallace gave a new theory of evolution which is explained in the details of Darwin’s book On the Origin of Species. Darwin was the founder of the Lunar Society, which was evolved over a long period of fifty years, was a dinner club. This club was an informal learned society which had never been recognized officially. However, there is enough evidence in history by the members of the club. The club included the prominent figures of Midlands Enlightenment, natural philosophers, intellectuals and industrialist. The members of the club would meet during the full moon, extra light in the night would make the journey easier and safer. Due to this, the club was later named as ‘Lunar Society’ mainly. Fourteen members have been identified as being a member of this society. Few of them are Erasmus Darwin, Josiah Wedgwood, Thomas Day, Matthew Bolton, Samuel Galton, and James Watt. The elite figures of the members helped in the Enlightenment of England in a scientific and industrial revolution. This facilitated the exchange of ideas between polite culture, practical technology, and experimental science. This helped in enabling the technological precondition for the rapid economic growth that the nation was going to attain. Erasmus died on 18 April 1802 in Breadsall Priory. During the last years, Darwin had inflammation in his breast and lungs. In the last spring, he had a serious attach of these diseases and repeated bleedings. Darwin was buried in All Saints Church in Breadsall.